The U. S. breezed right past France in 2010 as the world’s largest wine-consuming nation, according to wine industry consultant group Gomberg, Fredrikson & Associates in Woodside, California. U. S. consumption of wine grew 2% from the previous year to nearly 330 million cases. 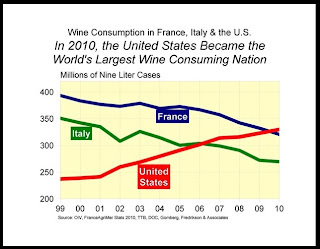 Total French consumption was 320.6 million cases in 2010. The estimated retail value of these U. S. sales was $30 billion, up 4% from 2009. California wine accounted for a 61% volume share of the total U.S. wine market with sales at 199.6 million cases, up 1% from the previous year. Retail value was $18.5 billion. California's total wine shipments worldwide to all markets in the U.S. and abroad (including exports) were 241.8 million cases, up 2% from the previous year. Sales of high-end wines remained challenging, but marketers used social media technology to reach increasingly wired consumers, said Fredrikson. Fredrikson estimates that Chardonnay led the California bottled table wines, with a 5% increase in 2010 to more than 53 million cases. Cabernet Sauvignon also grew rapidly, rising 6% to nearly 33 million cases. Other California bottled varietals growing notably in sales included Pinot Noir, Zinfandel, Riesling and Muscat. Thanks to The Wine Institute for reporting these statistics.